Charlotte, N.C., Nov. 8, 2013– Leading Charlotte-based commercial developers Childress Klein Properties and Crosland Southeast announced that they have reached agreements with award-winning David Weekley Homes and Terwilliger Pappas Multifamily Partners for the respective single-family and multifamily portions of the 90-acre former farm in South Charlotte. The site across from Rea Village at the intersection of Providence Road and Ardrey Kell Road will be the new home of Waverly, a master planned, multi-use lifestyle development. Representatives of Childress Klein Properties and Crosland Southeast are prepared to share the latest developments at an upcoming community meeting at Providence Country Club, scheduled for Tuesday, Nov. 12 at 7 p.m. A subsequent rezoning hearing, likely scheduled for December, will lead to a city council vote in early 2014. David Weekley Homes has been selected as the single-family developer of the estimated 150 single-family homes and townhomes at Waverly, which will be spread over approximately 18 acres of the development. There will be a wide variety of home designs, ranging from 2,000 to over 4,000 square feet. Townhomes will start in the high $300s and single-family homes will be priced from the $400s to the $600s. When building their new, award-winning homes, David Weekley Homes emphasizes LifeDesignSM by balancing form and function regarding sight lines, room placement, traffic patterns and windows and light. With these tried-and-true concepts, David Weekley Homes has won more than 440 design and industry awards. David Weekley Homes also incorporates sustainability measures to ensure that each development actively promotes healthier living, utility cost savings and environmental benefits. These earth-friendly benchmarks are achieved primarily through features such as 2’ x 6’ walls, low VOC paints, environmentally-friendly refrigerants and independent energy performance verification. 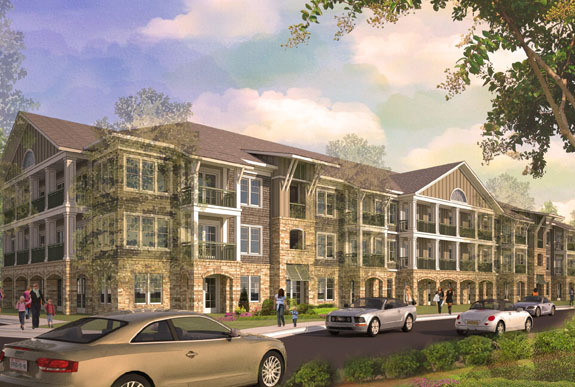 The company has brought their award-winning concepts and designs to several notable Charlotte-area developments, including Baxter Village, Springfield Manor and The Club at Longview. David Weekley Homes was the first builder in the United States to be awarded the Triple Crown of American Home Building, an honor which includes “America’s Best Builder,” “Builder of the Year” and the “National Housing Quality Award.” Since inception, David Weekley Homes has closed more than 70,000 homes. Terwilliger Pappas Multifamily Partners, the developers behind such well-known mixed-use developments as Metropolitan and Phillips Place, was selected to develop up to 375 upscale apartments called Solis Waverly apartments on approximately 18 acres. Led by two iconic power players in the industry, Ron Terwilliger and Peter A. Pappas, the company’s leadership team alone has developed more than 300,000 apartment homes and executed more than $4.5 billion in completed projects. Together, they have created a respected team of professionals dedicated to creating high-quality, desirable apartment communities in major southeastern markets. “Apartments developed by Terwilliger Pappas will reflect forward-thinking strategies considerate of the changing multifamily landscape and the needs of the firms’ resident, financial stakeholder and community constituencies,” states Peter A. Pappas, chief executive officer of Terwilliger Pappas. Pappas previously partnered with the Crosland Southeast principals on the award-winning, mixed-use development Birkdale Village in Huntersville, N.C., making the reunited Waverly development team a natural extension of previous successes. Solis Waverly luxury apartments is currently in the design stage but will offer one, two and three-bedroom floorplans, including many with optional direct access garages. The architectural design is reminiscent of a transitional Low Country styling with a warm textural palette, broad porches and pitched roofs. Interior features include 42-inch-kitchen cabinets, granite countertops, stainless steel appliances, granite countertops, full-size washers and dryers, ceramic tile showers, walk-in closets and more. The community will also feature a dog park, outdoor open gathering spaces with gazebos, a cutting-edge fitness center with yoga room, outdoor grilling and entertainment area with firepit surrounding the saltwater pool, a clubroom with demonstration kitchen and community room. The Crosland Southeast/Childress Klein team is taking Waverly through the rezoning process and will have a public hearing before the Charlotte City Council in December. The team, in conjunction with the Matthews Family, who has owned the land for over 150 years, immediately acknowledged that while the proposed development will be built upon an extraordinary heirloom, the vision of the multi-use development would be focused on the future value that it would bring to the surrounding community. It was determined that naming the property after the Matthews family may spur geographic confusion with its proximity to Matthews, N.C. Consequently, a classic, friendly name that would be pleasing for all product types was selected. The development of Waverly will mark a new era for the former Matthews family farm, and serve as a vibrant balance of uses in a pedestrian-friendly, multi-use environment. Waverly is a multi-use pedestrian friendly master plan, which is a joint venture between Childress Klein, Crosland Southeast and the Matthews family. Located just south of 485 at the intersection of Providence Road and Ardrey Kell, this 90-acre project affords the residents of South Charlotte an inviting place to dine or shop. The 250,000 square feet of retail will be anchored by a specialty grocer and have a focus on restaurants and outdoor dining. In addition, the project will provide two five- to six-story buildings offering Class A office space for corporations to locate in a neo-traditional environment and separate medical office buildings. The development will also offer approximately 375 upscale apartments on 18 acres, built by Terwilliger Pappas Multifamily Partners. David Weekley Homes will build approximately 150 single-family and town homes over 18 acres for residents who wish to purchase a home in a walkable community. The project is anticipated to be built over the next couple years after rezoning approval. Neighbors will be able to stay up to date about the development at www.waverlyclt.com once it is launched on Friday.